there was—until late 2016—a sandwich shop at the southeast corner of bloor and palmerston called Sky Blue Sky Sandwiches. it was the beloved-labour of one-time lawyer, chad, who sold his firm to open two operations that made you the best pulled pork sandwiches you’ve ever had—for $5.99! (there were other options of course, but the Kingpin was my order, once and always). rent for retail space along the bloor line rose to absurdity; daily maintenance was beginning to prove too much for him and his wife, so chad sold the business and moved to windsor. the new owner—after repeatedly promising to keep the business unchanged—didn’t show up the day after signing papers. and the next day thereafter. with no word from the new owner or the former, the shop clerks tried to keep the doors open for as long as they could, but running out of bread and with no guarantee of a paycheck they too stopped showing up—and that was it. chad was one of those business owners local politicians chase after for a photo-op during election season: hardworking, steady, fair-minded, easy-going, a believer in the community he served, and an enthusiastic receiver of everyone that walked through his door. he parked his car in the parking lot on markham street which my room’s window faced when i lived on palmerton—and at times as early as 6a.m. he’d begin unloading half a bakery of bread from the back seat of his minivan. we shared a mutual love for ray lamontagne’s first three studio albums (and a silent criticism of everything thereafter). it was he that got me into My Morning Jacket with high-sung praises of their live performances, and eventually convinced to me to give the album Circuital a listen (i’m eternally grateful). he’s a true believer in the magic of music; his sandwich shop is actually named after an album by his favourite band (Wilco). i hope all is well in windsor. the pulled pork sandwiches were great and so too were the music recommendations, but my regular attendance owed to other features of his business—one of the shop clerks in particular. she was from a town in south-central ontario called ‘Tiny Township’ and was taking a stab at city life. i asked her out somewhere in july 2015, and she told me to come back later and help close up shop. the Fringe Festival at that time was throwing a party in the mini avenue in-between the two sections of Honest Eds, so we headed there for fries. she lived somewhere up brunswick avenue and allowed to me walk her home. having just moved into a barely furnished basement apartment and was losing a campaign against a proliferating family of cockroaches, she was embarrassed and declined to invite me in. we instead stopped at the intersection right before her apartment for the perfunctory topics of chatter before someone eventually draws up enough courage to lean in for a kiss. one such topic was the park across from which we were standing. 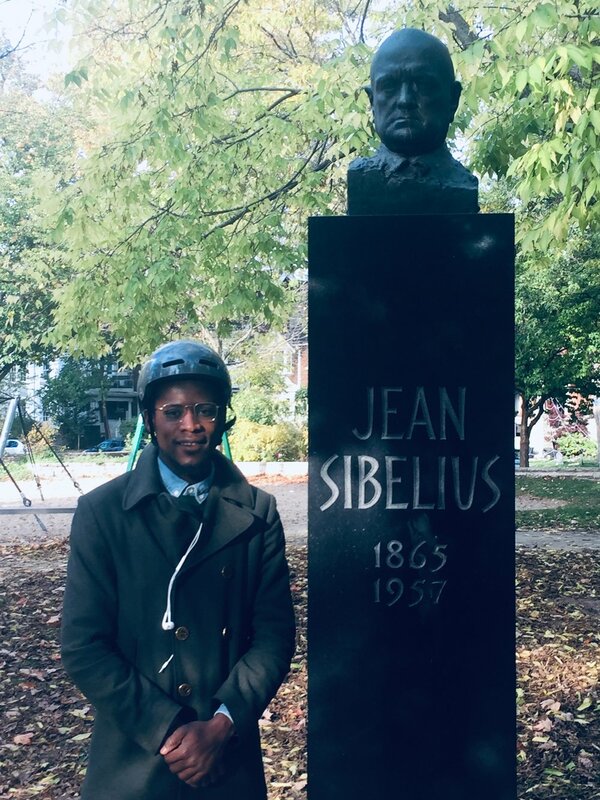 it was the Jean Sibelius Park at brunswick and wells street. and it was my first time there, not having known it existed. i giggled and said to her how earlier that week i had bought a couple recordings by that composer from Kops Records and had planned to listen to it that night before she said yes to a date. she too laughed and asked me why i bought it and i said i wanted something dark and serious. and that the picture of him on one of the cover arts looked very serious. she chimed in that his name too sounded dark and serious and that ‘you can’t be a serious composer with a name like chad or tyler’. i laughed, and she leaned in. her try at the city didn’t last very long, things got too expensive and she moved back home a couple months later. i live just down the street from that park now, and one of those aforementioned records is this double-bill of sibelius’ only concerto and one of his tone poems called ‘The Swan of Tuonela’. i hope all is well in tiny township. an afternoon in October?—that is this concerto in four words. the intensities of the cadenzas, their ‘colour’, are the reds and yellows of our wiry maples this late into the month. but it’s not that simple: at the base of all this colour one expects to find the usual terrestrial elements, the proximity of the rest of the orchestra at every step. instead, there is ice and precipice everywhere, ice at the base of autumn!—or how else should one describe the tremendous altitudes achieved these colourful cadenzas (especially of the Allegro ma non tanto). in keeping with my bad habit of describing a work of art through the use of other works as a crutch: this violin concerto is really what you’d expect if you asked sibelius to write you a Rites of Autumn, or some makeshift finnish sacre d’automne. or, if one was really out of musical ideas and chose to transmogrify a painting into its musical counterpart: lawren s. harris’ Autumn Forest with Glaciated Landscape (ontarian member of the Group of Seven, previously displayed at the AGO). despite the painting’s lousily gilded tri-sectional frame, it’s sentiment is nevertheless communicated. everytime i walked by it in the AGO, even in the middle of july, i couldn’t help but suffer a flash of the coziest sweater-weather-sentiments. as well as, the iciest, most uninhabitable winter february morning. that is the visual manifestation of this violin concerto: of its cheerful embrace of a glaciated isolation. ﻿(Wanderer Above the Sea of Fog—caspar david friedrich)———yet another painting that came to mind while listening to this recording. it describes the lofty heights ascended by the solo instrument, the tumultuous and glacial scenery below, and the alluring anonymity of the painting’s lone subject. that cane in his right hand could easily be imagined as a violin; and that anonymous profile could just as easily be revealed as jonathan crow (principal violinist/concertmaster of our very own TSO). these developments are moreso ascensions; the solo instruments is the masthead soaring above the orchestra, unbounded by the usual back and forth dialogue of a concerto. unlike vaughan williams’ The Lark Ascending—wherein the orchestra was at every step of the ascent, as a guardian, a mother lark—this ascent is a much different kind. more like that of a hawk, decidedly headlong and obstinate. far below its height, as a measure of contradistinction, is the booming caterwaul of the orchestra’s symphonic developments. these symphonic developments do not support the solo instrument, anymore than the blasts of ice beneath the Wanderer reflects the calm he enjoys in the air of his heights. and at the end of the second movement, after the solo instrument finally falls out of sight, the last bars are given to the orchestra to make the faint echo of a tired wing’s final flap. then like a cold northern Danse Macabre, the third movement again takes up the same ascent. it is an amazing thing how this one animal can inspire such a multivariety of musical ideas. sibelius’ Swan is quite unlike the regal gaiety of saint-saens’ Swan. the Swan of Tounela guards the underworld of finnish mythology, and is portrayed in this composition by the english horn as an ominous, gargantuan amorous bird of prey. robert layton describes the melody of the english horn as floating ‘on an arctic sheen of strings’—what an absolutely brilliant image! and that is the experience of the Swan of Tuonela: the warm enchantment and magical southern winds of the cor anglais suspended above the strain of a seemingly possessed string section. i can almost hear the arias that would have exploded from the opera that sibelius had intended to write around his Swan of Tuonela. i think we are well due for some operatic reboots. my first idea was a Peter Grimes spinoff called Ellen Orford. it would be a titanic task, but one well worth it, to unearth whatever notes sibelius scribbled down for The Building of the Boat. britten divided his Four Seas throughout Grimes, and the result was an unforgettable musical experience. i could imagine The Swan divided along those same lines, with oeven for mores effects.